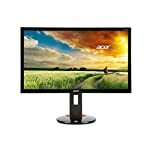 The AOC I2757FM is one of those screens that doesn’t necessarily target gamers, but it does a good job for the price. 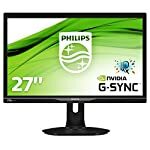 You don’t get cutting edge gaming features such as G-Sync and high refresh rates with this one, but don’t let that put you off if you are looking for a good value monitor. At 27″ you might find the 1080 HD resolution too low for more detailed work, many users are moving to 1440p at this resolution but of course this comes with additional cost (both the monitor and the graphics card capable of running games at quad high definition resolution). 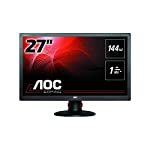 Given the price, the AOC is an attractive looking monitor, the style beats the classic shiny black look in my opinion. Whilst it might look metallic from the pictures it is actually a plastic frame, but it looks good and the thin bezel is always appreciated. The screen is also thinner than expected, good if you wish to have it pushed right back on your desk. It’s good to see that AOC haven’t skimped on the design, although it’s not without its problems. The stand is great for adjustability, you only get the option to tilt it and there is no height adjustment option or the ability to rotate into portrait mode. Unfortunately some users have mentioned a wobbly stand in their reviews. It comes with two HDMI ports, one of which is MHL compatible if you want to hook it up to a mobile device. It also has a VGA port if you still have a need for one, but of course you won’t be able to use it for sound – VGA is video only. As mentioned, this isn’t exactly a gamer orientated monitor and the I2757FM scores well on colour accuracy and as you would expect from an IPS based monitor viewing angles are also great with colours still looking bright and vibrant even from an angle. So for day to day work this will be fine for all but the fussiest of users. When it comes to gaming, the AOC scores well for input lag, so playing games will feel responsive. You won’t get that disconnected effect where the games seems slightly out of sync with your movements. However the screen does suffer from some ghosting, the IPS panels are not known for their fast response times and, with the exception of the game orientated models, they can be problematic in games with fast motion such as FPS games. That said, the monitor’s “overdrive” functionality can be played with to get better results, other owners have suggested that the medium setting gives a noticeable reduction in blurring – but don’t step it up to the maximum as this produced undesirable effects. Your mileage may vary. We give the AOC I2757FM a 4.5 out of 5 rating. Want to know what existing owners of the monitor think? You can read real user reviews here. 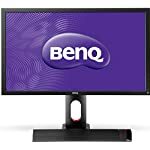 Should I buy the AOC I2757FM? 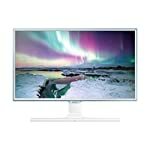 This monitor will suit someone looking for great colour reproduction at a low cost. It might not be best suited for someone looking for a screen that's just for games. If you are having some doubts about this purchase then why not read some real owner reviews and see what other buyers think. Welcome to the AOC I2757FM FAQ. This section attempts to answer common questions you may have, please get in touch if you have any more queries or if you think our answers need updating. Does this have a DisplayPort adapter? It comes with 2 x HDMI port, you could get an adapter if you needed to.